It’s the end of an era; after what feels like a hundred years, Andrew Lincoln is leaving The Walking Dead. This continues to confirm our theory that British non-soap actors live in terror of being typecast and hate to be stuck in one role for too long, although in the case of Lincoln it may already too late to avoid being typecast. We believe that for the rest of his life, Lincoln will be asked by fans to yell, "Carl", in the horrible southern accent is has affected for The Walking Dead. Inevitably, this is going to immensely change the Walking Dead which has very much been the Rick show. From the very beginning of the first episode, it has always been clear that Rick was the protagonist and the one man who can never die - from overcoming Shane, to establishing the Rickocracy, to becoming the near messianic figure he was at the end of the last season, Rick is front and central. There may be the odd break while we spend a couple of episodes on another character, but Rick has always been the core of this show. Even when Rick decided to bow out of leadership and become a farmer, the rest of the cast members spent their time trying to get Rick back in the game. And now that is going to change. In many ways we can’t even predict what the Walking Dead will look like without Rick in the centre. Will we still be focusing on the growing alliance of city states that are slowly recreating a nation? Will we almost spin off to a whole new direction, moving away from the main action like Morgan did on Fear the Walking Dead? We can’t even guess. Ok, what about Ezekiel? I’d be behind an Ezekiel centre - think of it, the dramatic ruler who led his people by means of a tiger and flamboyant cosplay, was dragged down to reality with a dead Shiva and a whole lot of dead people, only to rise from the ashes as a new leader. How does he integrate the lessons he’s learned? Does he throw out the King entirely or does he realise that there’s a place for showmanship? This could be compelling to see the King come forward as a true leader without the the mask. Ok - Carol! Of course it would have to be Carol! One of the few characters who has been with us since Season 1, she’s been destroyed, rebuilt herself, made small children look at flowers, danced on the edge of becoming truly evil, lurched back from the edge so hard she nearly fell apart in face of what she’d become, only to charge through that and step up again as the glorious wrath of god we know her to be. No character has been broken, reforged, broken, reforged as much as she, while still showing a powerful caring side looking to Ezekiel and Daryl. Can you see her now pushing to make these communities work? Not the leader, but the fixer - the one there with kind word and reassurance when a leader doubts or needs someone to talk to - and the one who will be the first to step up if a threat arrives. Carol, head of the Walking Dead, it would be perfect. Oh my God guys, they went with another cishet, white able bodied man? Who could have guessed this?! 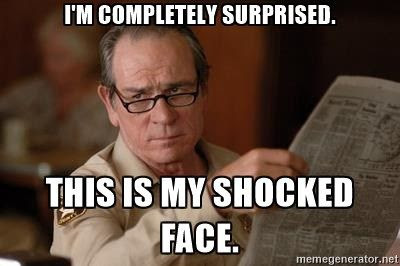 I’m shocked! Shocked! This is my shocked face! Not only is it tiresomely predictable that we’d leap on the next cishet white man who looks all broody and can use a crossbow, but I also can’t see it working well with the character - or, rather, with the elements of this character that actually make Daryl interesting. In a genre where cishet white men nobly lead their lessers to glory, Daryl stands out among so many other fit, strong, broody, dangerous cishet white men: he’s vulnerable. He’s even weak. The most compelling scene I can remember with Daryl is not him rambo-ing zombies with his crossbow, but finding a book on dealing with childhood abuse while Carol watches with understanding and sympathy. The most interesting elements of Daryl’s character is that, for all the trappings of alpha-male-dom, Daryl is a follower. Yes he can be the strong-silent loner but over 8 seasons it’s become clear that Daryl likes to be a strong, silent supporter. Daryl is a follower, Daryl is a great right hand man. Daryl seems to latch on to someone else for guidance: we’ve seen him with Merle, with Rick even with Carol; Daryl generally doesn’t take the lead. Daryl is much more comfortable being the supporter and that in itself is revolutionary. We have a cultural ideal that alpha males are the idea, that alpha males need to be in charge, that a man needs to be competitive, in control. To have this classical Alpha Male be a follower, be actually vulnerable (rather than just having a few episodes of manpain) was surprisingly subversive. While this could continue when he becomes the protagonist - I don’t see it. I think we’re far more likely to see a strong, sure protagonist - either virtually spinning off, Morgan-style, for his own semi-solo adventures or otherwise stepping up. It would take finesse and considerable originality to centre a post-apocalyptic story on a follower, on someone who doesn’t make decisions, doesn’t lead, doesn’t drive the action. 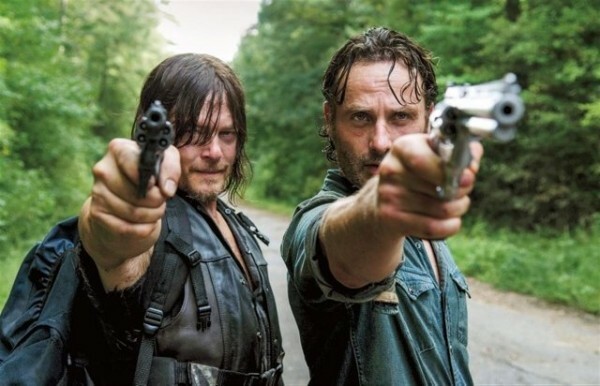 With the departure of Andrew Lincoln, The Walking Dead had the opportunity to take the show into an entirely new place, perhaps giving it the reboot it needs to revitalise itself and do something original with the genre and the lead - but it’s looking highly unlikely they’re going to pull that off.